Total deaths in US mass shootings. Locations of US mass shootings in 2015, according to Shooting Tracker. There is no fixed definition of a mass shooting, but a common definition is an act of violence—excluding gang killings, domestic violence, or terrorist acts sponsored by an organization—in which a gunman kills at least four victims. Using this definition, one study found that nearly one-third of the world's public mass shootings between 1966 and 2012 (90 of 292 incidents) occurred in the United States. Using the same definition, Gun Violence Archive (external link) records 152 mass shootings in the United States between 1967 and May 2018, averaging eight fatalities per incident when the perpetrator's death is included. The United States has had more mass shootings than any other country. Shooters generally either die by suicide afterwards or are restrained or killed by law enforcement officers or civilians. There is no fixed definition of a mass shooting in the United States. The Investigative Assistance for Violent Crimes Act of 2012, signed into law by Congress in January 2013, defines a "mass killing" as one resulting in at least 3 victims, excluding the perpetrator. In 2015, the Congressional Research Service defined a mass shooting as "a multiple homicide incident in which four or more victims are murdered with firearms, within one event, and in one or more locations in close proximity". A broader definition, as used by the Gun Violence Archive, is that of "4 or more shot or killed, not including the shooter". This definition, of four people shot regardless of whether or not that results in injury or death, is often used by the press and non-profit organizations. 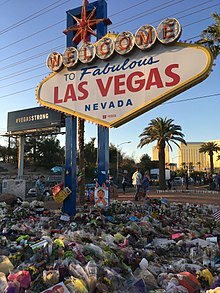 Memorial at the Welcome to Fabulous Las Vegas sign following the 2017 Las Vegas shooting, which resulted in 59 deaths and 851 non-fatal injuries. In recent years, the number of public mass shootings has increased substantially, although there has been an approximately 50% decrease in firearm homicides in the nation overall since 1993. The decrease in firearm homicides has been attributed to better policing, a better economy and environmental factors such as the removal of lead from gasoline. A comprehensive report by USA Today tracked all mass killings from 2006 through 2017 in which the perpetrator willfully killed 4 or more people. For mass killings by firearm for instance, it found 271 incidents with a total of 1,358 victims. Mother Jones listed seven mass shootings, defined as indiscriminate rampages in public places resulting in four or more victims killed, in the U.S. for 2015. An analysis by Michael Bloomberg's gun violence prevention group, Everytown for Gun Safety, identified 110 mass shootings, defined as shootings in which at least four people were murdered with a firearm, between January 2009 and July 2014; at least 57% were related to domestic or family violence. Other media outlets have reported that hundreds of mass shootings take place in the United States in a single calendar year, citing a crowd-funded website known as Shooting Tracker which defines a mass shooting as having four or more people injured or killed. In December 2015, The Washington Post reported that there had been 355 mass shootings in the United States so far that year. In August 2015, The Washington Post reported that the United States was averaging one mass shooting per day. An earlier report had indicated that in 2015 alone, there had been 294 mass shootings that killed or injured 1,464 people. Shooting Tracker and Mass Shooting Tracker, the two sites that the media have been citing, have been criticized for using a broader criteria – counting four victims injured as a mass shooting – thus producing much higher figures. Higher accessibility and ownership of guns. The US has the highest per-capita gun ownership in the world with 120.5 firearms per 100 people; the second highest is Yemen with 52.8 firearms per 100 people. Mental illness and its treatment (or the lack thereof) with psychiatric drugs. This is controversial. Many of the mass shooters in the U.S. suffered from mental illness, but the estimated number of mental illness cases has not increased as significantly as the number of mass shootings. Under 5% of violent behaviors in the U.S. are committed by persons with mental health diagnoses. The desire to seek revenge for a long history of being bullied at school. The widespread chronic gap between people's expectations for themselves and their actual achievement, and individualistic culture. Desire for fame and notoriety. Also, mass shooters learn from one another through "media contagion", that is, "the mass media coverage of them and the proliferation of social media sites that tend to glorify the shooters and downplay the victims". Failure of government background checks due to incomplete databases and/or staff shortages. Several types of guns have been used in mass shootings in the United States, including rifles, handguns, and shotguns. A 2014 study of 142 shootings by Dr. James Fox found 88 (62%) were committed with handguns of all types, (68 (48%) with semi-automatic handguns, 20 (14%) with revolvers), 35 (25%) with semi-automatic rifles, and 19 (13%) with shotguns. The study was conducted using the Mother Jones database of mass shootings from 1982–2018. High capacity magazines were used in approximately half of mass shootings. Semi-automatic rifles such as the AR-15 or similar have been used in six of the ten deadliest mass shooting events. The following mass shootings are the deadliest to have occurred in modern U.S. history (1949 to present). Only incidents with ten or more victim fatalities are included. ^ a b c The fatality total includes an unborn child. ^ During the massacre, the perpetrators used three .22 caliber handguns of an unknown type which were never recovered by the authorities. ^ "US Mass Shootings, 1982–2017: Data From Mother Jones' Investigation". ^ a b c Greenberg, Jacobson & Valverde, Jon, Louis & Miriam (February 14, 2018). "What we know about mass shootings". Politifact. Tampa Bay Times. Retrieved February 20, 2018. As noted above, there is no widely accepted definition of mass shootings. People use either broad or restrictive definitions of mass shootings to reinforce their stance on gun control. After the 2012 Sandy Hook school shooting, Congress defined "mass killings" as three or more homicides in a single incident. The definition was intended to clarify when the U.S. Attorney General could assist state and local authorities in investigations of violent acts and shootings in places of public use. ^ a b c d e f Christensen, Jen (October 5, 2017). "Why the US has the most mass shootings". CNN. Retrieved November 6, 2017. ^ Lankford, Adam (2016). Public Mass Shooters and Firearms: A Cross-National Study of 171 Countries. Violence and Victims, Volume 31, Number 2. Retrieved: May 3, 2018. ^ Berkowitz, Bonnie; Gamio, Lazaro; Lu, Denise; Uhrmacher, Kevin; Lindeman, Todd (October 5, 2017). "50 years of U.S. mass shootings: The victims, sites, killers and weapons". Washington Post. Retrieved November 5, 2017. ^ U.S. Leads World in Mass Shootings. The Wall Street Journal. Retrieved: October 2, 2017. ^ Why the U.S. is No. 1 – in mass shootings. Los Angeles Times. Retrieved: October 2, 2017. ^ a b The United States Has Had More Mass Shootings Than Any Other Country. Mother Jones. Retrieved: October 2, 2017. ^ Ingraham, Christopher (December 3, 2015). "What makes a 'mass shooting' in America". Washington Post. Retrieved November 5, 2017. But starting in 2013, federal statutes defined "mass killing" as three or more people killed, regardless of weapons. ^ Follman, Mark. "What Exactly Is A Mass Shooting". Mother Jones. Retrieved August 9, 2015. In January 2013, a mandate for federal investigation of mass shootings authorized by President Barack Obama lowered that baseline to three or more victims killed. ^ Krouse, William J.; Richardson, Daniel J. (July 30, 2015). "Mass Murder with Firearms: Incidents and Victims, 1999–2013" (PDF). FAS.org. Congressional Research Service. Retrieved February 21, 2018. ^ "General Methodology". Gun Violence Archive. Retrieved February 21, 2018. ^ Nichols, Chris (October 4, 2017). "How is a 'mass shooting' defined?". PolitiFact California. Retrieved February 21, 2018. ^ Christensen, Jen (August 28, 2015). "Why the U.S. has the most mass shootings". CNN. ^ a b "About the Mass Shooting Tracker". Mass Shooting Tracker. Retrieved June 13, 2016. ^ Axelrod, Jim (November 6, 2017). "Are Americans becoming "numb" to mass shootings?". CBS Evening News. Retrieved February 21, 2018. ^ "Rate of mass shootings has tripled since 2011, new research from Harvard shows". Mother Jones. Retrieved December 13, 2017. ^ Ehrenfreund, Max (December 3, 2015). "We've had a massive decline in gun violence in the United States. Here's why". Washington Post. ISSN 0190-8286. Retrieved December 13, 2017. ^ Mark Follman; Gavin Aronsen; Deanna Pan (June 12, 2016). "A Guide to Mass Shootings in America". Motherjones.com. Retrieved June 13, 2016. ^ Mark Follman; Gavin Aronsen; Deanna Pan. "US Mass Shootings, 1982–2016: Data From Mother Jones' Investigation". Motherjones.com. Retrieved June 13, 2016. Original date December 28, 2012 ; list updated every 5 minutes. Figures for years 2011–2015: 3, 7, 5, 4, 7. ^ Melissa Jeltsen (July 18, 2014). "Mass Shooting Analysis Finds Strong Domestic Violence Connection". The Huffington Post. Retrieved June 13, 2016. ^ "More than one mass shooting happens per day in the U.S., data shows". PBS NewsHour. October 2, 2015. ^ Victor, Daniel (February 17, 2018). Mass Shooters Are All Different. Except for One Thing: Most Are Men. The New York Times. Retrieved: April 10, 2018. ^ Engber, Daniel (October 6, 2017). "Mass Shooters Aren't Disproportionately White". Slate Magazine. Retrieved April 23, 2019. ^ a b c d e Healy, Melissa (August 24, 2015). "Why the U.S. is No. 1 – in mass shootings". LA Times. Retrieved November 6, 2017. ^ "The real mental health issue behind gun violence". CNN. January 25, 2016. Retrieved November 7, 2017. ^ "Psychiatric Drugs and Violence: A Review of FDA Data Finds A Link". Psychology Today. Retrieved May 30, 2018. ^ Campbell, Holly (December 2, 2015). "Inside the mind of a mass murderer". WANE.com. Retrieved November 9, 2017. ^ Fox, James Alan (January 16, 2011). "The real causes of mass murder". Boston.com. Retrieved November 9, 2017. ^ Anderson, Rick (November 4, 2013). "Op Ed -- IMHBCO (In My Humble But Correct Opinion) -- Database Legislation -- Separating Myth from Fact". Against the Grain. 16 (2). doi:10.7771/2380-176x.4289. ISSN 2380-176X. ^ Burgess, Ann Wolbert, Christina Garbarino, and Mary I. Carlson. "Pathological teasing and bullying turned deadly: Shooters and suicide." Victims and Offenders 1.1 (2006): 1–14. ^ Dorell, Oren (December 18, 2012). "In Europe, fewer mass killings due to culture not guns". USA Today. Retrieved August 11, 2015. ^ Mills, Kim (August 4, 2016). ""Media Contagion" Is Factor in Mass Shootings, Study Says". ^ Johnson, Kevin. "Texas Church Shooting Background Check Failure." USA Today. November 9, 2017. Accessed November 17, 2017. https://www.usatoday.com/story/news/politics/2017/11/09/texas-church-shooting-background-check-breakdown-highlights-federal-gun-record-problems/847947001/. ^ Barrett, Devlin. "FBI's Gun Background Check Database Missing Records." Chicago Tribune. November 10, 2017. Accessed November 17, 2017. http://www.chicagotribune.com/news/nationworld/ct-fbi-gun-background-check-system-missing-records-20171110-story.html. ^ Todd, Michael (December 23, 2013). "The Simple Facts About Mass Shootings Aren't Simple at All". Pacific Standard. Retrieved August 21, 2018. ^ Schildkraut, Jaclyn; Jaymi Elsass, H. (2016). Mass Shootings: Media, Myths, and Realities: Media, Myths, and Realities. ABC-CLIO. ISBN 978-1-4408-3653-4. ^ "Criminology Professor to CNN's Tapper: Mass Shootings Aren't an 'Epidemic'". Media Research Center. June 16, 2014. Retrieved August 20, 2018. ^ "US Mass Shootings, 1982–2018: Data From Mother Jones' Investigation". Mother Jones. June 28, 2018. Retrieved August 20, 2018. ^ Fisher, Marc (February 15, 2018). "The AR-15: 'America's rifle' or illegitimate killing machine?". The Washington Post. Retrieved May 11, 2018. ...high-capacity magazines have been used in more than half of mass shootings over four decades, according to several studies. ^ Politifact staff (May 18, 2018). "The facts on mass shootings, guns in the United States". Politifact. Retrieved June 11, 2018. ^ Pearce, Matt (February 14, 2018). "Mass shootings are getting deadlier. And the latest ones all have something new in common: The AR-15". The Los Angeles Times. Retrieved May 11, 2018. ^ "Deadliest Mass Shootings in Modern US History Fast Facts". CNN. April 1, 2018. Retrieved April 6, 2018. ^ a b c d e f g h i "Deadliest Mass Shootings in Modern US History Fast Facts". CNN. Retrieved November 5, 2017. ^ a b c d e "Texas gunman used same rifle as Las Vegas, Newtown mass shooters". NY Daily News. Retrieved November 7, 2017. ^ Carissimo, Justin (November 6, 2017). "26 dead in shooting at church in Sutherland Springs, Texas". CBS News. Retrieved November 6, 2017. ^ Emanuella Grinberg; Eric Levensen (February 14, 2018). "At least 17 dead in Florida school shooting, law enforcement says". CNN. Retrieved February 14, 2018. ^ Cole, Matthew; Thomas, Pierre; Ryan, Jason; Esposito, Richard (November 19, 2009). "'Cop Killer' Gun Used In Ft. Hood Shooting, Officials Said". ABC News. Retrieved October 30, 2018. ^ Carter, Chelsea J. (August 23, 2013). "Nidal Hasan convicted in Fort Hood shootings - CNN". CNN. Retrieved October 30, 2018. ^ "Columbine killer has cult of fans long after death". New York Post. February 24, 2016. Retrieved October 29, 2018. ^ McFadden, Robert D. (April 3, 2009). "Gunman Kills 13 and Wounds 4 at Binghamton, N.Y., Immigrant Center". nytimes.com. Retrieved October 30, 2018. ^ Berger, Meyer (September 7, 1949). "Veteran Kills 12 in Mad Rampage on Camden Street". The New York Times. Retrieved July 6, 2018. Howard B. Unruh, 28 years old, a mild, soft-spoken veteran of many armored artillery battles in Italy, France, Austria, Belgium and Germany, killed twelve persons with a war souvenir Luger pistol in his home block in East Camden this morning. He wounded four others. ^ Sauer, Patrick (October 14, 2015). "The Story of the First Mass Murder in U.S. History". Smithsonian Magazine. Smithsonian Institution. He went into his apartment, uncased his German Luger P08, a 9mm pistol he’d purchased at a sporting goods store in Philadelphia for $37.50, and secured it with two clips and 33 loose cartridges. ^ 99-9005 (United States Court of Appeals for the Third Circuit October 31, 2001) ("On September 25, 1982 in Wilkes-Barre, Pennsylvania, Banks shot fourteen people with a Colt AR 15 semi-automatic rifle, killing thirteen and wounding one."). ^ 513 Pa. 318 (Supreme Court of Pennsylvania 1987) ("In the space of about one hour, appellant shot fourteen people with a Colt AR-15 semi-automatic rifle, killing thirteen and wounding one."). ^ Kang, Martha (February 26, 2010). "Wah Mee Massacre prisoner closer to release". Komo News.com. ^ Castillo, Michelle (July 20, 2012). "Colo. shooter purchased guns legally from 3 different stores". cbsnews.com. Retrieved October 30, 2018. ^ Jacobo, Julia (July 21, 2017). "A look back at the Aurora, Colorado, movie theater shooting 5 years later". ABC News. Retrieved October 30, 2018. ^ Hermann, Peter; Marimow, Ann E. (September 25, 2013). "Navy Yard shooter Aaron Alexis driven by delusions". Washington Post. Retrieved October 30, 2018. ^ Madhani, Aamer (July 2, 2015). "What happened in 2013 Navy Yard mass shooting". USA TODAY. Retrieved October 30, 2018. ^ "Gunman kills 12 in California bar". BBC News. November 8, 2018. Retrieved November 8, 2018. ^ "Mass shooting at California dance bar". CNN. November 8, 2018. Retrieved November 8, 2018. ^ Machi, Vivienne (September 24, 2016). "40 years later, Ruppert family murders still traumatic". Dayton Daily News. Retrieved March 27, 2018. ^ "Hate crime charges filed in Pittsburgh synagogue shooting that left 11 dead". CNN. Retrieved October 27, 2018. ^ "10 In Brooklyn Are Found Slain Inside A House". The New York Times. April 16, 1984. Retrieved March 27, 2018. ^ Osunsami, Steve; Carter, Bill; Mooney, Mark; Mcguirt, Mary; Schabner, Dean (March 12, 2009). "Cops Close to Motive in Murderous Rampage". ABC News. Retrieved October 30, 2018. ^ Dewan, Shaila; Sulzberger, A.G. (March 11, 2009). "Officials Identify Alabama Gunman". nytimes.com. Retrieved October 30, 2018. ^ Andone, Dakin; Allen, Keith; Almasy, Steve. "Alleged shooter at Texas high school spared people he liked, court document says". CNN. Retrieved May 25, 2018.